I decided to create a chequerboard effect for the pincushion. 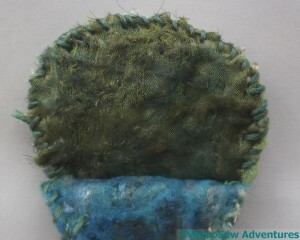 The four panels are stab-stitched together with the raw edges visible. I think that makes for an interesting effect, although it can be over-used. 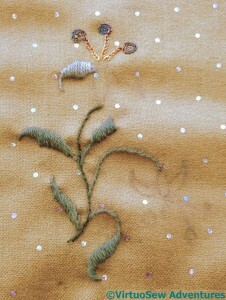 The first panel has a few French Knots, lots of straight stitches, and some singleton scroll stitches around the base of the stems. 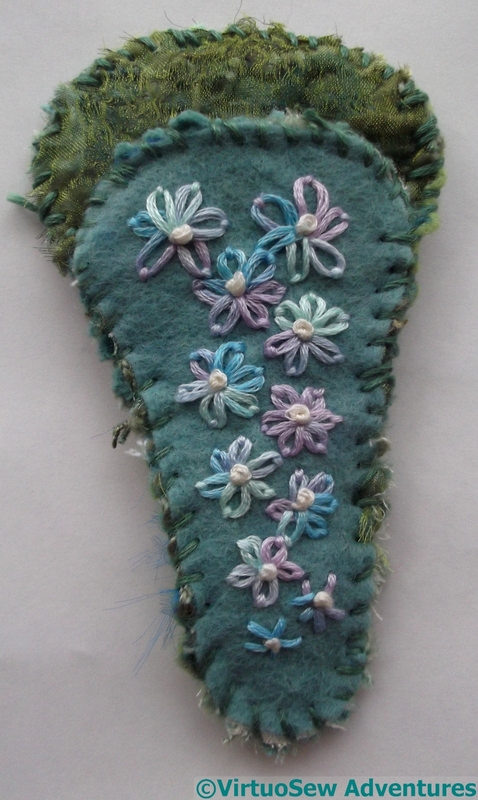 The second is lots of French knots, and palmate leaves made of lazy daisy stitches. The third is primarily lazy daisy stitch, with the flowers made using blanket stitch. 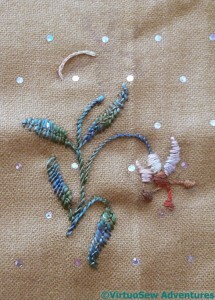 The four panel is feather stitch with French Knots. 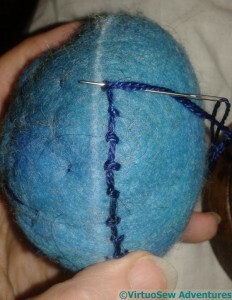 The pincushion is only lightly stuffed. I felt that somehow stuffing it to the point of solidity wouldn’t be quite right, although I don’t know why. 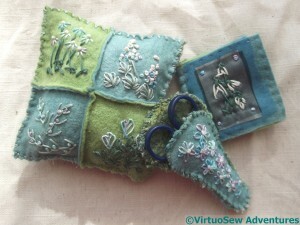 In this case I closed the edges with glove stitch. 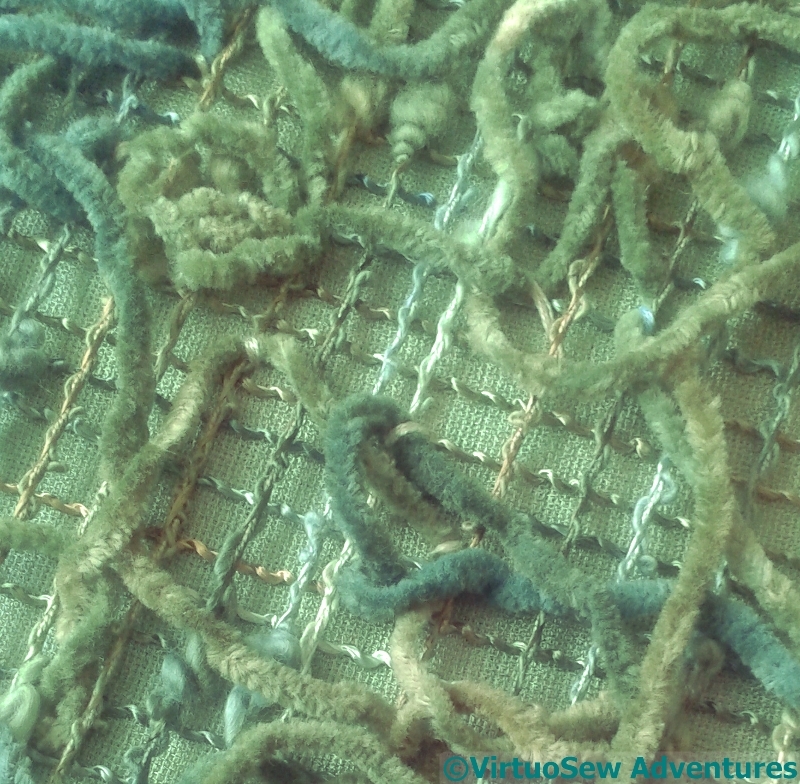 This is really a sort of variant on overcast stitch, so it isn’t difficult, but – even with shaggy bits of embellished fabric appearing around the edges! – it gives a slightly more “finished” effect. 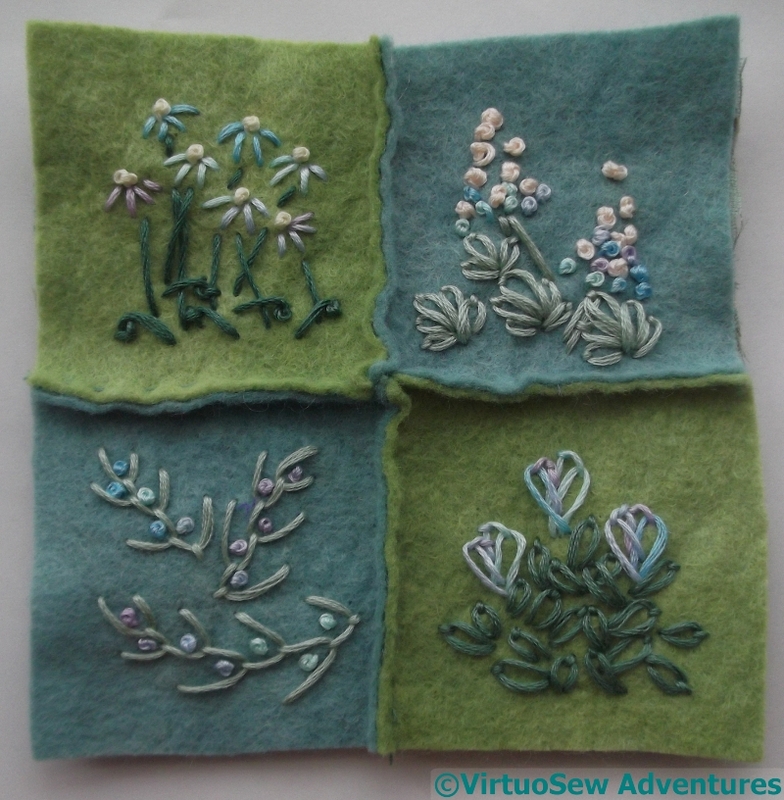 The finished set looks cheerful and springlike, in spite of the increasingly distant relationship between the stitchery and the spring flowers that inspired me. 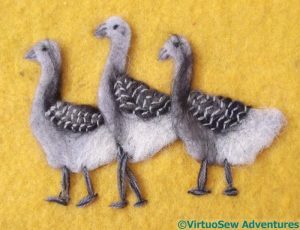 I’m rather pleased; even if it took me months to find the inspiration, the final result makes me smile! I’m continuing to think about that quotation from Pliny, and considering how I might bring it to life. In the meantime, I’m trying to develop some familiarity with small-scale dyeing, rather than the huge machinery of my course, so when I heard that The Wild Dyery, not far away, was running an evening of indigo dyeing, I decided to go along. 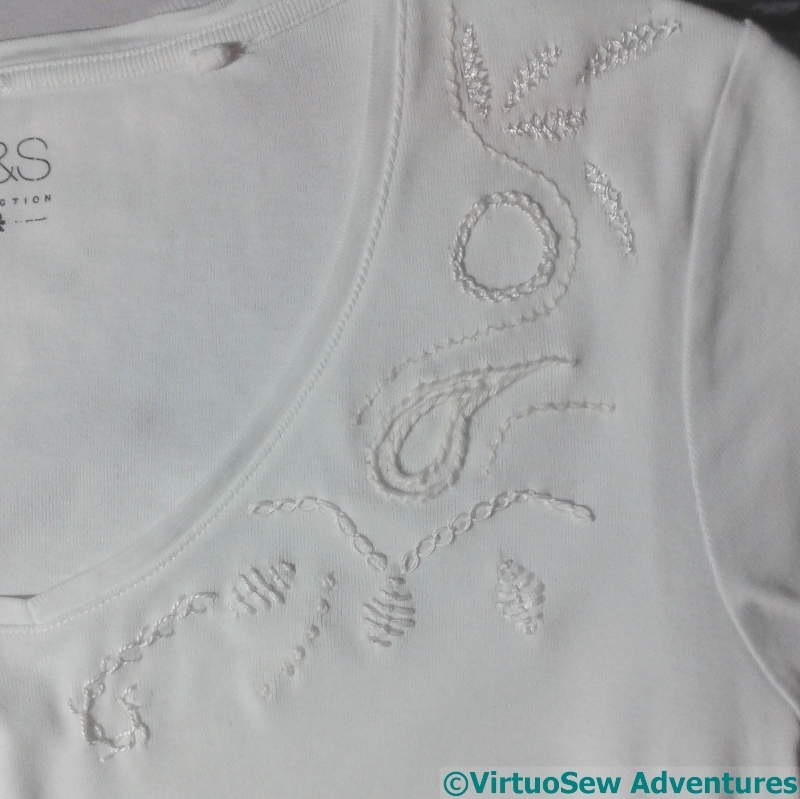 I found a cotton T-shirt in a charity shot, and proceeded to embroider it using every different white thread I could find. I want to see how the different threads respond, because it occurred to me that I could add to my adventures by embroidering with mordanted threads. Ever the over-complicatrix of my own life….! 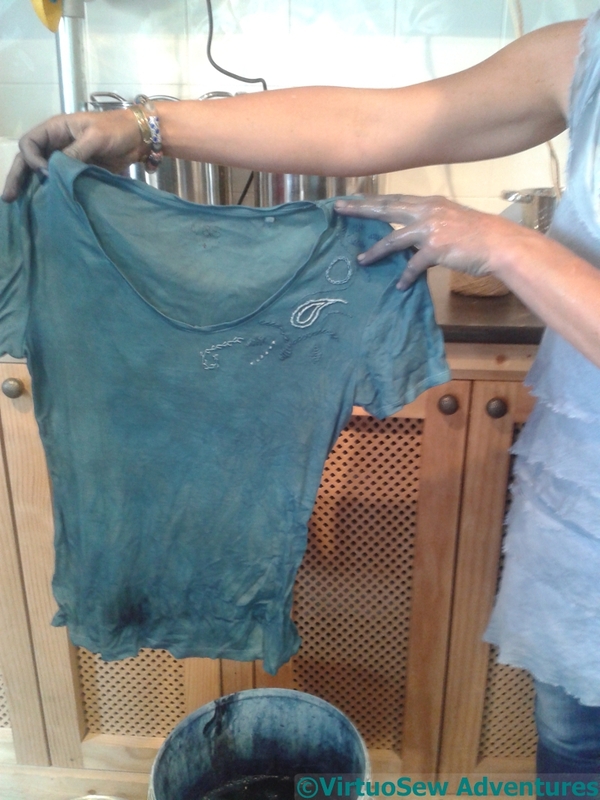 Justine, owner, tutor, and guide in our adventure, kindly hauled everyone’s pieces out of the dyebath for them. As the dyeing process with indigo is an oxidation reaction, incautious splashings in the dyebath, even drips from a piece being removed, can compromise the dyebath by removing dye from it before it has a chance to bond with fabric. Besides, as she commented – there’s no need for everyone to leave with blue hands! 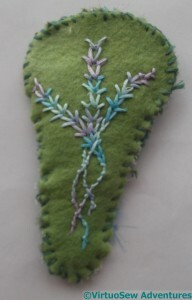 The herringbone stitch leaf shapes are in Anchor Marlitt, and that seems to have taken the dye nicely. I’d expect that, I think, although the thread is so glossy I might have expect it to have some finishing treatment. 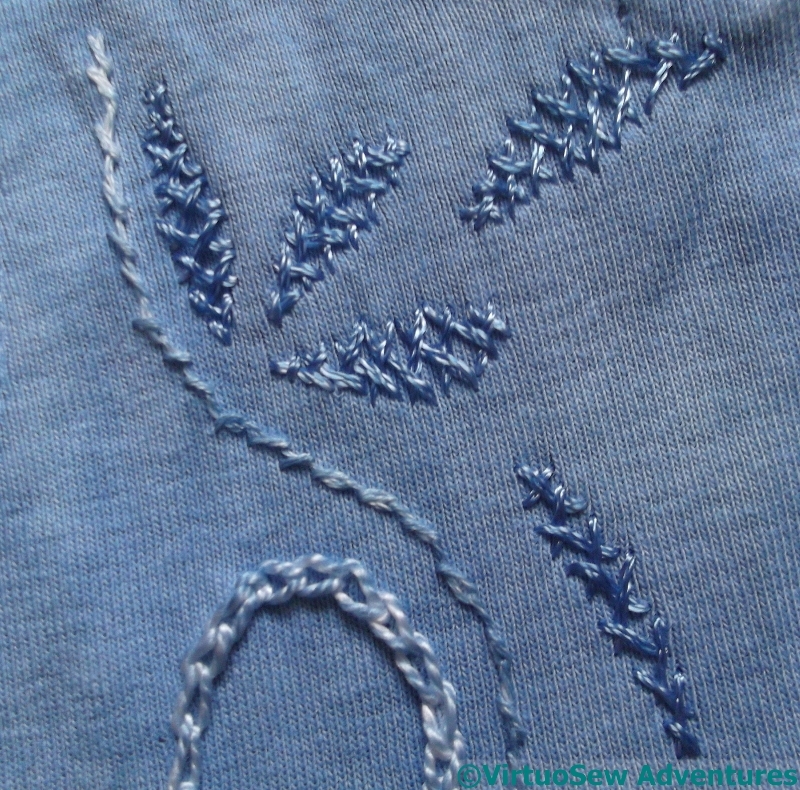 The line of twisted chain stitch is in that frustrating DMC linen. 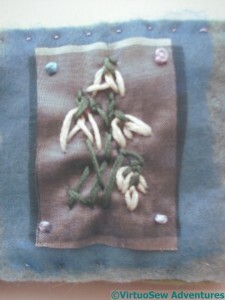 I didn’t enjoy stitching with it, as it it rough, stiff and lifeless. It’s taken the dye in a rather patchy fashion, and I suspect as I wear and wash the T-shirt, the dye will wear off even more. 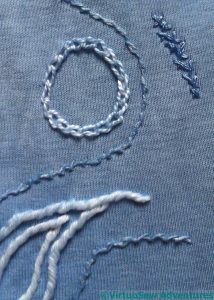 The next, the circle of chain stitch, is pearl cotton, and this is such a popular thread with the companies that overdye threads that I was expecting it to take the colour much more strongly. The next photo shows that circle in full, together with the twisted chain stitch in linen thread that curved around it. 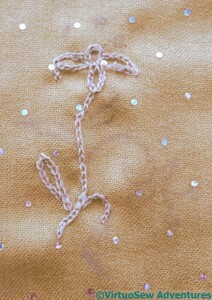 The paisley shape in stem stitch is in soft embroidery cotton, and this absolutely astonished me. I was expecting at least some signs of attachment, but there are only the faintest suggestions that the dye was able to attach to the yarn. 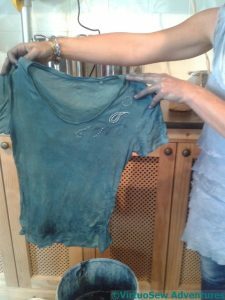 Cotton usually takes dyes really well – just think of how easy it is to revive an old cotton shirt with a packet of dye – and if, anything I was expecting it to be one of the darker results. As it is, I think this will wear off in short order! 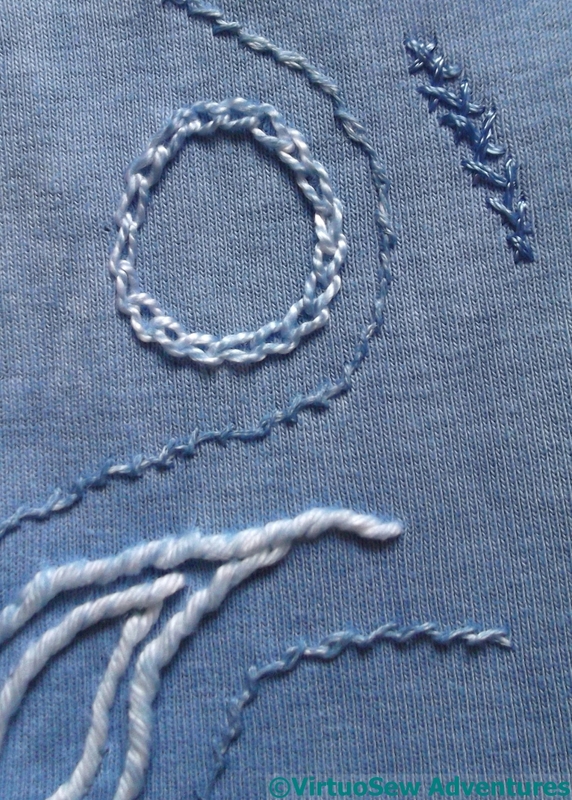 The line of cable chain stitch is more the colour I was expecting from the soft cotton. It’s a tightly twisted, stiff, mercerised crochet cotton, and it seemed to swallow the dye and hang on to it. 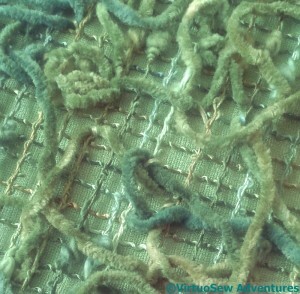 The diamonds of romanian couching stitch are stranded cotton. 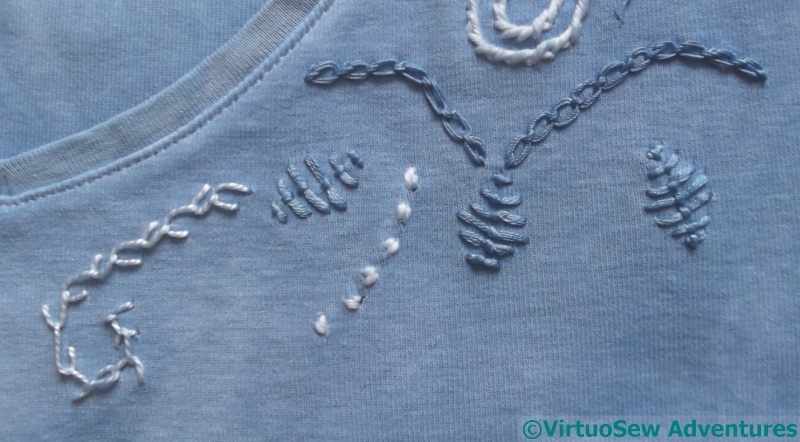 That has taken the dye well, too, although there are hints that whenever the threads have crossed each other there has been a resist effect, which may show more as the T-shirt is worn. 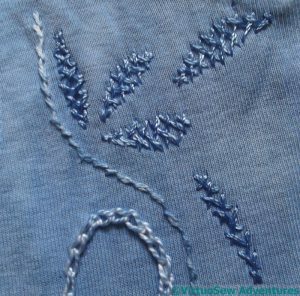 The feather stitch is pearl cotton and the trail of seed stitch is soft cotton, and they haven’t taken the dye any better than before. Well, that’s given me something to think about, hasn’t it! 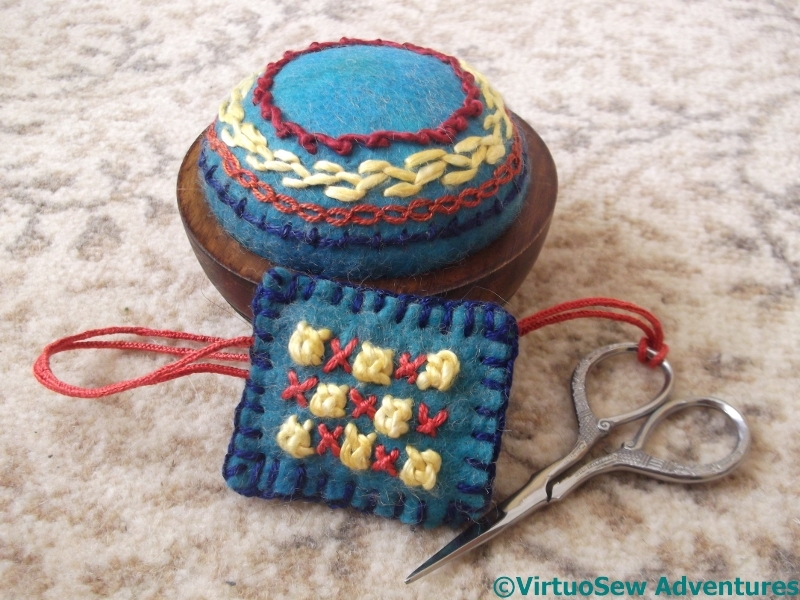 Once I’d finished the little needlebook, using the little pack from Rowandean, I thought I might have a bit more of a play, and make a scissors case and a pincushion. So I fished out a piece of dyed silk left over from a book box my mother made for her fine binding of The Wind In The Willows, and a whole hank of fantastical, textured threads, and spent an afternoon tacking them in place and then playing with my embellisher, in order to create a mossy, textural piece of fabric to line the scissor case and back the pincushion. Bear with me, I know the textures would snag the scissor blades! 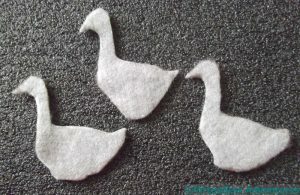 I used some of the pieces of gauze from the kit – also run gently through the embellisher – to smooth down the lining. The texture is still there, but it has been muted and slightly smoothed over. And now the scissors will be beautifully padded and protected! The edges are simply whipstitched – a considerable effort, through two layers of felt and two layers of the embellished fabric, but I’m glad to say I didn’t break any needles doing it! 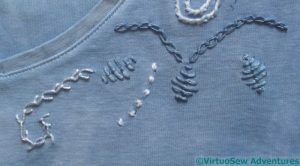 For the front and back, again I used simple stitchery, in undivided stranded cotton. A vaguely wisteria-like (not really Spring any more…!) 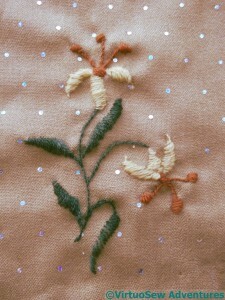 fall of lazy daisy flowers with French Knot centres enliven the front. And three wheatear stitch stems (seedheads left over from winter, perhaps…?) decorate the back. The variegated thread makes all the colour changes happen by magic, and since my other main project at the moment is the 40-count tent stitch of Eve In the Garden Of Eden, six strands of stranded cotton is a blessed relief..! You may recall that last year – or was it the year before? – I joined in a “Make & Take” at the Rowandean stand in Harrogate. Last time, I bought a little kit and one of Katrina’s pages of ideas and brought them home to play with. Of course, as we all know, the Bringing Home is the easy part… ! The colours are soft and fresh, springlike, so I thought I would start by playing with forms vaguely inspired by spring flowers. 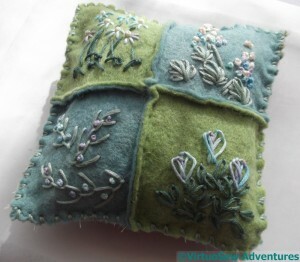 The ultimate inspiration here was from snowdrops, made by stitching a fly stitch and a twisted fly stitch on top of one another. It has almost worked, certainly close enough for my purposes. Maybe an embroidering botanist would like to play a bit more. 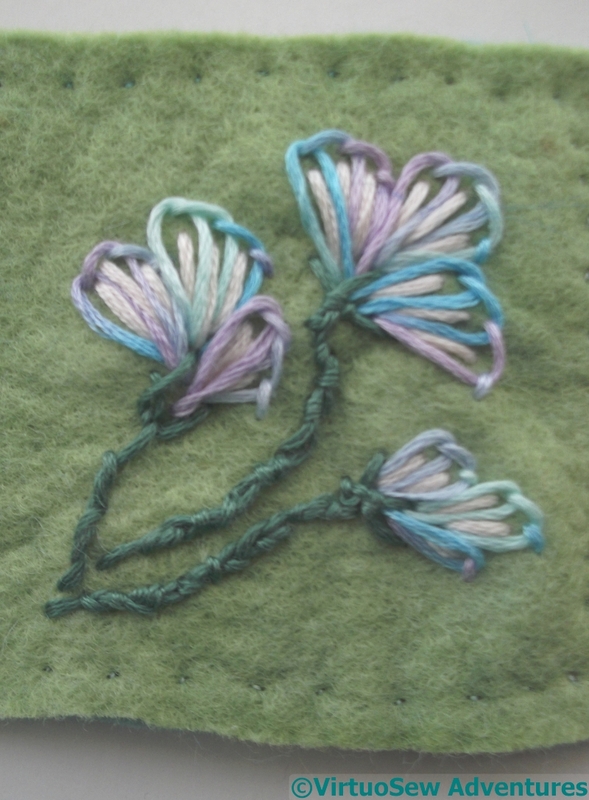 The flowers are stitched on a piece of gauze which is layered over a piece of silk, which in turn lies over apiece of felt. 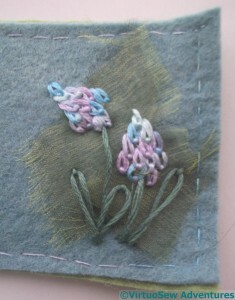 The french knots in the corners held everything together while I tackled the flowers. The next fragment was vaguely inspired by grape hyacinths, which are among my favourite spring flowers. Overlapping detached chain stitches worked well, and layering gauze over the felt helped to bring the flowers out from the background. 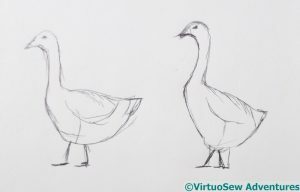 I may choose to fray the gauze further, but I was struggling with light at this point and decided to see what I thought under different atmospheric conditions! I did mention that I’m no botanist! The ultimate inspiration here were the stripy crocus I see a lot near where I live. 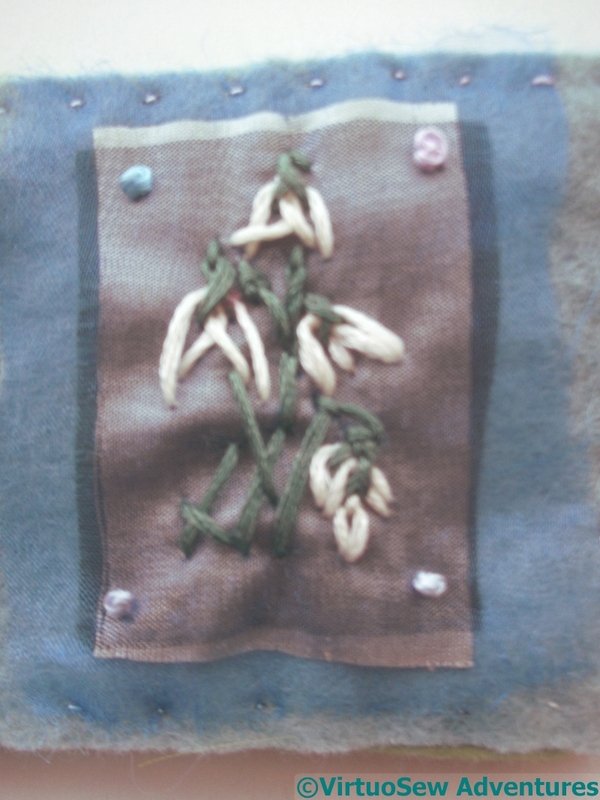 They are getting a little old and blowsy, not the trim, upright bolts of colour that first appeared, but nevertheless the ones I’ve stitched look more like some strange new flora, unknown to either science or art! I’ve turned the resulting pile of felt into a needlebook, rather more illustrated that is usual, and with a dramatic stitched spine. This was a distinct piece of experimentation – I could have done with a milliner’s needle, but not having one I improvised with a beading needle, which was very flimsy and flexible, but did the job in the end. Now I’ve put it under a heap of books to flatten it gradually without the squashing effect of an iron. And I still have some felt, some thread, and some gauze left over for further experimentation! Just before Christmas I was struggling with the “Dreams of Amarna” designs, but I still had itchy fingers from longing to stitch, and sore eyes from staring at “Eve In The Garden of Eden“, so I wanted something a bit less precise..
My Dad’s shaving cream comes in a rather nice wooden pot. There are refills, but sometimes the shop doesn’t have them, and consequently – since they’re much too nice to throw away – my parents have ended up with something of a stockpile. 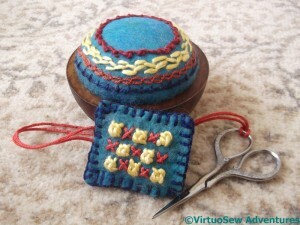 I’ve taken one of them off their hands, and turned it into a pincushion. At the moment the lid is being used as a coaster, but I am open to suggestions for it! The threads are silks, bought at the Knitting and Stitching Show, worked on felt acquired at the same time. 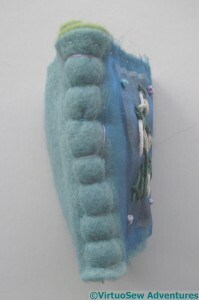 I created the shape of the pincushion itself with shaping stitches, stitching around and around the padding and the felt top layer, rather as doll and puppet makers do, and once I’d settled it into the bowl, I drew a chalk line around the waist, took the pincushion out, and started stitching. Coral Stitch, Cable Chain (do I ever do anything that Cable Chain doesn’t sneak into somehow? 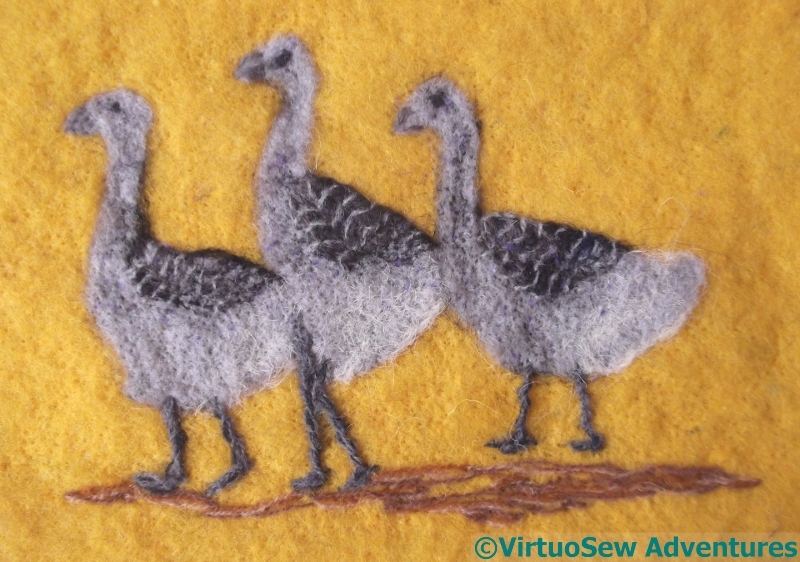 ), Semi-Closed Feather Stitch, and Scroll Stitch, all stitched into the felt, catching as little of the stuffing as I could. 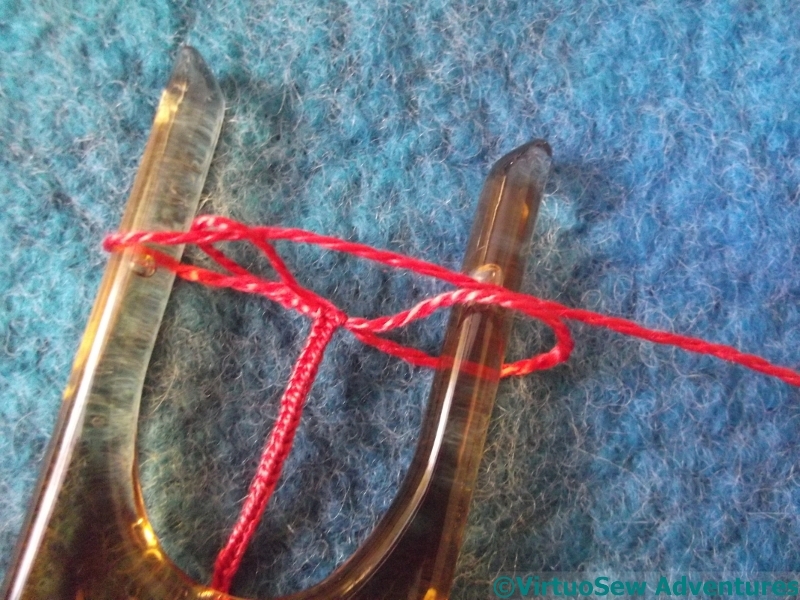 Then I decided to do make a scissors-keeper for my lovely Ernest Wright and Son Ltd scissors, so I started by using one of the threads, and my lucet, to make a cord for it. 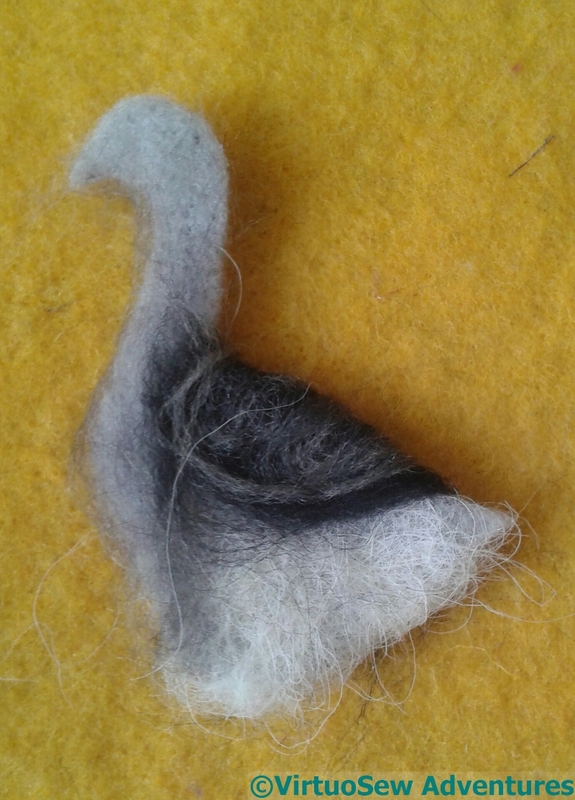 I’d forgotten some of the knack of lucetting, but it came back gradually, and it’s ever so satisfying! The stitches on the scissors keeper are Sorbello Stitches (another favourite of mine) and Tied Cross Stitches, and the the pieces of felt are stitched together with ordinary blanket stitch. In silk! The pashmina, when it arrived, was a lovely caramel colour, with rather unanticipated silver spots on it, and it was a good deal flimsier than I was expecting. The others I have are all in fairly sturdy twill weaves. In truth, I’m not sure that would be easier, and if I ever finish this one, I may choose to find out.. Regular and long term readers of my blog will be aware that I have a thing about scale – scale of thread, scale of stitch, scale of weave. 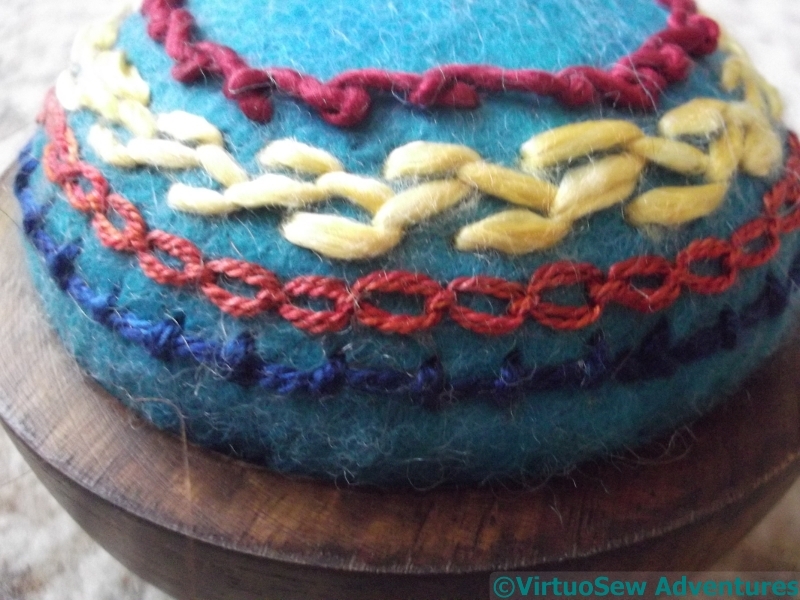 I’ve even discovered – much to my surprise – that the dreaded Plaited Braid Stitch isn’t always easier when it’s stitched wider and longer. So it will be no surprise that I spent a bit of time playing with various different threads to see what I thought of them, before settling on a final choice. Scale isn’t the only concern, either. The right texture and sheen matter as well. In the end I have settled on silks. The Medici yarn might have worked if I had had more of it, but I don’t think it is even made any more. The Appletons crewel wool was too heavy, and the Gumnut yarns (although I love them) somehow didn’t settle in comfortably. Now I have to unpick my experiments and get started. 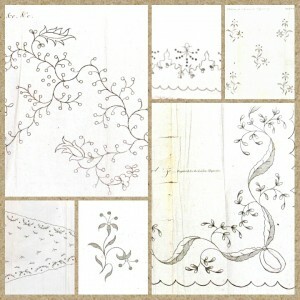 I already have a newfound respect for any lady of the period who embroidered her muslin dresses, or her silk gauzes. There’s a story that Jane Austen embroidered a muslin dress with satin stitch spots, and the mere idea gives me cold shivers! Although I doubt they had to contend with stuck-on paillettes! I still believe there is a lot to do for the Dreams of Amarna, but at the same time, when I have moments when I know what I am doing and have brain power to spare, I am thinking about the Conversion of Placidus panel that I’d like to do, inspired by Elizabeth Goudge, Pisanello, and La dame a la licorne. In fact I’ve already bought some calico for the base layer and I’m wondering how to get the design onto it in a reasonably stable but not intrusive fashion. Inktense blocks have been suggested, and when I bought some I was told that once the pigment has been washed over with water, it becomes permanent. 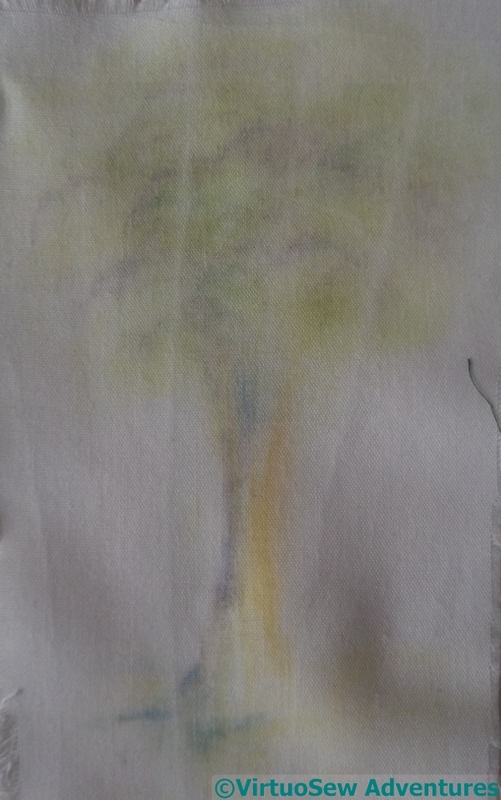 So I found a scrap of cotton and sketched a rather cotton-wool-ball-on-a-stick sort of tree on it, using all of the colours in my selection. 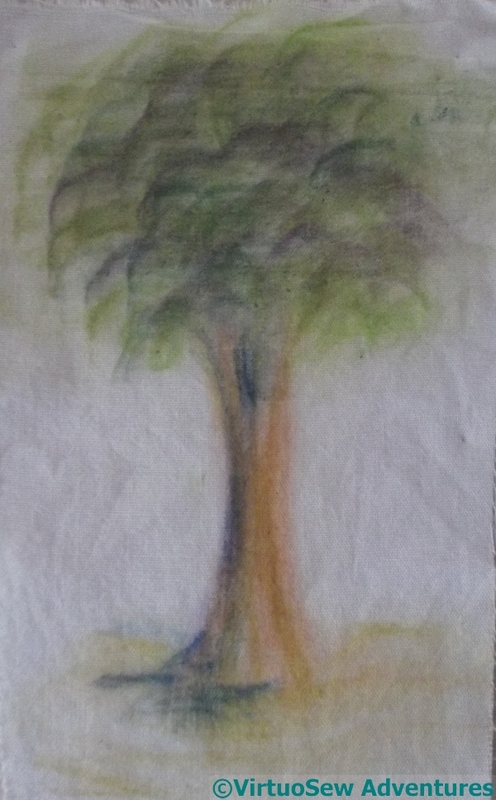 Then I painted over it with water, allowed it to dry, and ironed half of the picture. Then the scrap went into the washing machine. I’m not expecting to do this to Placidus, by the way. It’s just that I assumed that the abrasion would be a good challenge even if the detergent wasn’t, and it will certainly be subject to abrasion when I’m making it! As you can see, the ironing made no difference at all! A lot of the colour has gone, but I think this is in fact enough for my purposes. 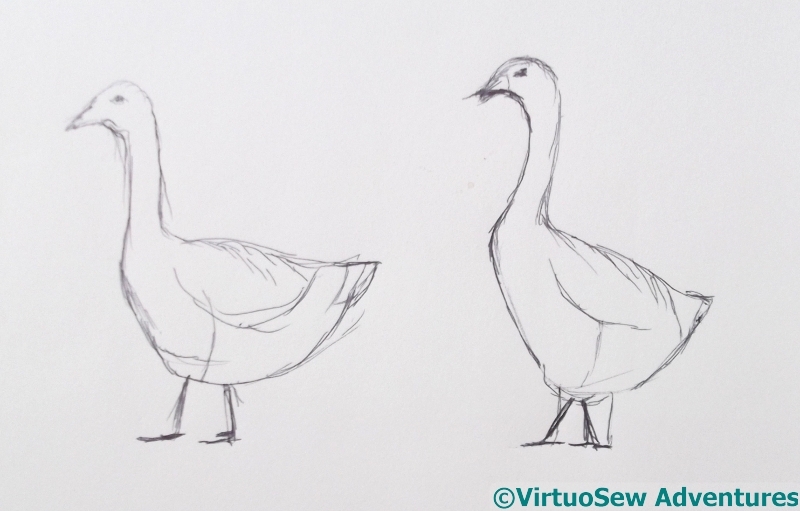 Most of the panel will be applied to the calico, one way or another, so however I get the design onto the calico, it will only be a sketch map to keep me on the right track. I do know about textile medium, by the way, but my supplier of the Inktense didn’t have any!